…and a promotional video that aimed for tugging at heart strings, but instead made a mid-2010s audience laugh hysterical and make it viral! A very healthy discussion came up after last week’s Ponderosa article – turns out, readers and friends really engage when nostalgia takes on a personal topic. In this case, it was eating at Ponderosa. All of that out of the way, let’s grab our appetites as restaurant month continues on Allison’s Written Words. Keeping on with the buffet concept restaurant, we’re focusing our attentions on a similarly-themed steakhouse/seafood/menu/buffet option restaurant that enjoyed its heyday at the same time Ponderosa was a big deal. It’s a place that brings us choices, and it is sizzlin’! Just humor me. It’s all I ask. When I was a kid in the early-mid 1990s, there were two buffet restaurants my family went to – Ponderosa (which was covered last week) and Sizzler, which was very much like Ponderosa in its offerings. I lived fifteen minutes from Ponderosa, so that was the one my family went to a little more regularly, but once in awhile, we would go to Sizzler if we were down near the mall (we lived about 30 minutes from Sizzler). Our family liked both, but again, Ponderosa usually won out. It had to be sometime in the mid-1990s (maybe closer to the late 1990s), around the same time as Ponderosa closing its local location, but Sizzler just suddenly disappeared and left its physical location intact. It has taken on various forms over the years. I think it was a bank briefly, then a ninety-nine cents store, before becoming (this is a real laugh) a seventy-nine cent store. I’m not kidding, it was facing going out of business as a 99-cent store, so someone thought up the genius idea of making it into a 79-cent store. I went past it this past Saturday on the way to Wal-Mart, and they had their “Valentine’s Day Store” banner up under the actual sign. 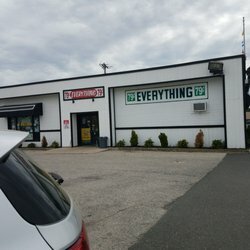 The store is in a failing shopping center (ironically named Cardiff Power Center) that used to have a grocery store, Karin’s Curtains, and Bradlees in it. Now it is a mixed-use shopping center complete with Forman Mills, a gym, and a school. And the 79-cent store on a pad site. It is actually kind of depressing to see that store, since it retains the old-school Sizzler look. I haven’t seen a Sizzler in at least 20 years, but elsewhere, Sizzler is sizzlin’! You have your fancy descriptive words, I have mine! But first, a history lesson! Sizzler was founded in 1958 in Culver City, California as Del’s Sizzler Family Steakhouse by Del and Helen Johnson. During the 1970s and 1980s, Sizzler was a steakhouse and seafood restaurant with a salad bar, with an aim to provide quality food at slightly above fast food prices. But competition emerged with the aforementioned Ponderosa (and its now sister restaurant, Bonanza), and Sizzler headed the call. In the early 1990s, Sizzler began offering a buffet option, called the Buffet Court. It expanded upon the optional salad bar and included all the foods you could already get on the menu, but also had salad and a – everyone’s favorite – dessert bar! Who hasn’t reacted this way to ice cream? As more people opted for the buffet option, rather than the sit down menu, Sizzler lowered the quality of the menu items. This in turn, hurt their business and resulted in Chapter 11 bankruptcy in 1996, resulting in 140 (of 215 stores at the time) closures and a new logo design. Management changes in the late 1990s upgraded the food quality and increased costs. With the early 2000s came a makeover to the dining rooms of existing locations, a new menu, and a return to Sizzler’s steakhouse roots, with more of an emphasis on what Sizzler was already known for, and the phasing out of the Buffet Court. Turns out, this has worked well, but honestly, knowing it is no longer what it was saddens me a little, even though it has been over twenty years since my last visit to Sizzler. 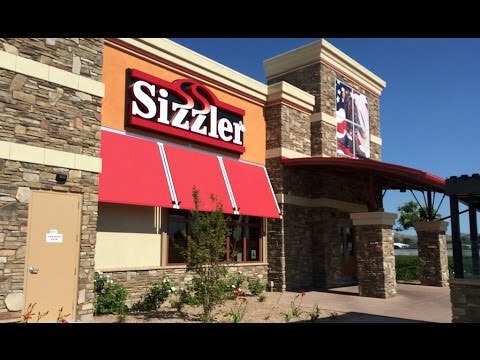 Today, Sizzler operates 270 locations between Washington State and San Diego, as well as locations in Idaho, Utah, Arizona, Nevada, and New Mexico. The company is based on Mission Viejo, which qualifies as quite possibly the most perfect community in Southern California I’ve ever seen, right down to AstroTurf lawns I saw in a neighborhood I visited. We drove through Southern California, from Los Angeles International Airport to Hemet (Riverside County, about 2 1/2 hours east of Los Angeles), and I saw between five and ten Sizzler locations between Los Angeles, Hemet, and Temecula. My heart was happy to see the chain still open, but saddened that its days on the east coast are long gone. And no, I didn’t eat there. Knowing now that it isn’t the same Sizzler I grew up with would only have disappointed me. Now At Sizzler, One Special Taste! And a whole lotta commercial gold! Did you really think I was going to write this article and not include it? The magic behind this is too much for, well, anyone. Did you ever eat Sizzler? Have you tried all-you-can-eat shrimp, dined on The Amazing Steak and Tossed Salad Offer? I’d love to hear some more delicious discussion. I want to hear from you! Tell me your Sizzler stories! Until next week, enjoy the freedom of choice! When I was growing up our Ponderosa and Sizzlers were just down the street from one another and my parents always preferred Ponderosa. We didn’t get to Sizzler very often, but when we did I always loved it. The last time I was in a Sizzler, I was in Australia, where they still exist. Even though it was on the other side of the planet, the taste was the same and so was the vibe. FYI, I’m loving these restaurant nostalgia articles! My fiancee said there was one particular menu item he always liked (can’r recall what at the moment) at Sizzler. That’s awesome that the vibe never changed. Makes me feel good that nostalgia is alive and well! Thank you, i have two more planned for this month! Next month, im switching it up to a different theme.